EXCLUSIVE Cover Reveal for Heather Demetrios’s THE LEXIE PROJECT (Something Real #2)! Hello there everyone! Today, as part of Heather Demetrios’s Blogger Caravan, I have an EXCLUSIVE cover reveal for her new book, THE LEXIE PROJECT! I am going to start off by assuming you’ve heard of SOMETHING REAL, Heather’s debut. If you haven’t, the summary is below and click on the cover to add it to your Goodreads shelf! SO, what does SOMETHING REAL have to do with anything? Heather’s new book for which I have the exclusive cover reveal down below just so HAPPENS to be the sequel to SOMETHING REAL! 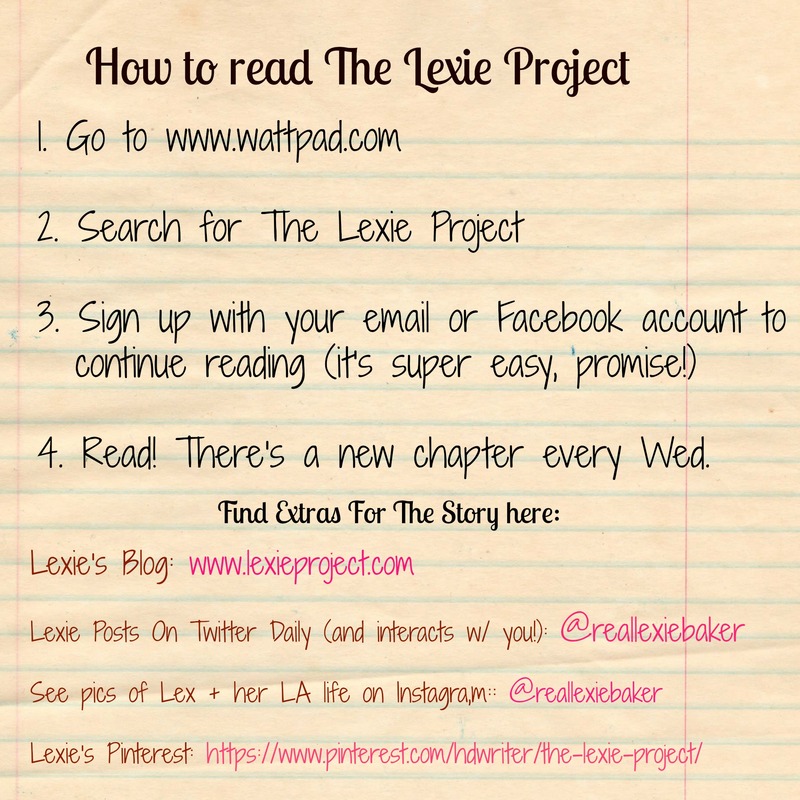 SO, below you will find the cover, a photo of Lexie, and a guide to reading THE LEXIE PROJECT. Are you ready, guys? Because this is going to be FUN. ALRIGHT, GUYS. Are you ready to see the cover?!?!?!?!? Lexie demands you be ready! Nearly a year after graduating high school and taking a hiatus from her family’s reality TV show, “Baker’s Dozen,” Lexie is in Los Angeles, on a mission to take Hollywood by storm. From red carpet premiers to helping her YouTube star roommate film weird videos, Lex fits right in with the droves of girls just as hungry as she is for some screen time. When Jax Wilson, a young, hot producer, offers to launch The Lexie Project, a reality show that will chronicle Lex’s adventures trying to make it as an actress in LA, she jumps at the chance. It isn’t an Oscar-winning role, but it’s a start. Then she meets Liam, a film student who brings books to parties and is one of her twin brother’s closest friends. When it becomes clear that her brother, Benny, has a serious drinking problem that’s causing his life to spiral out of control, Lexie relies on Liam to help protect her brother from the media…and himself. But spending time with Liam soon makes Lexie question if the life of a starlet is really what she wants. And if it is, how far will she go to get it? This companion novel to Something Real features several major characters from the novel. Perfect for fans of The Lizzie Bennet Diaries, Lexie’s novelized memoir is a multiplatform storytelling experience told in real time that reaches readers through social media, including weekly chapter installments on Wattpad. Daily updates on Lexie’s social media accounts will give readers the chance to interact directly with Lexie and have opportunities to influence the course of the story. Also: Heather is doing a fun thing next week where she’s asking people to post pics of themselves wearing heart shaped sunglasses (you can get them on Amazon or any party store). She will retweet and upload them to Lexie’s Instagram. the hashtags are #lexieproject #imreadinglexie You can also post the button down below if you don’t have a pic and use the same hashtags. What do you think about the cover of The Lexie Project? Are you excited to read it? LET LEXIE, HEATHER AND I KNOW IN THE COMMENTS! ← Sunday Street Team: Kissing in America by Margo Rabb Review+GIVEAWAY! The Lexie Project sounds pretty amazing and I really love the cover! It’s colorful, fun and girly. (Just my style) Can’t wait to read more of your posts! Ahh, now I definitely have to get around to reading Something Real! 😀 I love the image for this new cover, even if the fonts aren’t my type. And it’s so cute that it’s going to be shared for free on Wattpad!